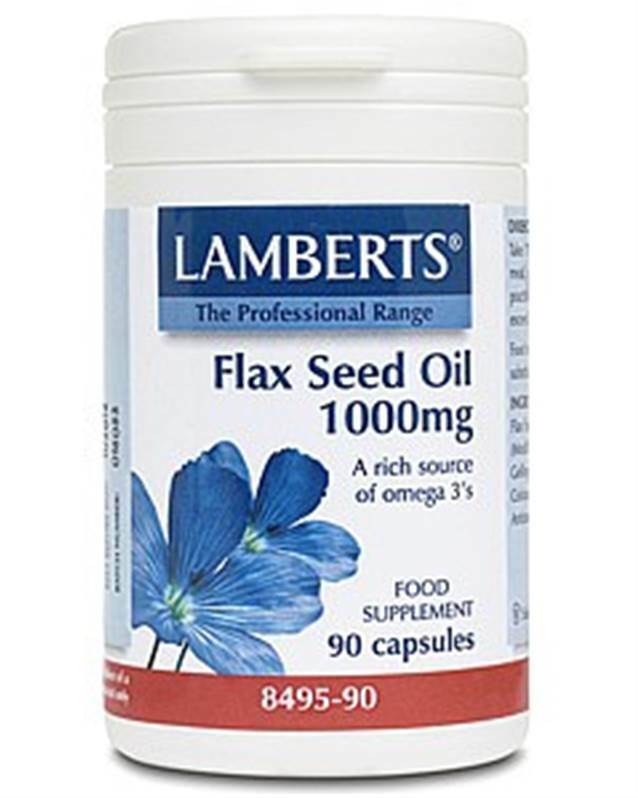 Lamberts Flax Seed Oil 1000mg, Uses: one of the world's richest vegetarian natural food sources of the omega 3 essential fatty acid alpha-linolenic acid. Flax seed oil is an excellent alternative to fish oils as the oil obtained from flax seed is 60% by weight alpha-linolenic acid. Healthy bodies are able to convert alpha-linolenic acid into the omega 3 fatty acids present in fish oil (EPA and DHA) as required. Flax seed oil is also a useful source of linoleic acid, the 'parent' fatty acid to the omega 6 fatty acids, for which evening primorose is so well known. Lamberts flax seed oil is cold pressed to ensure that the nutritive qualities are retained. Each Lamberts Flax Seed Oil 1000mg capsule contains a full 500mg alpha-linolenic acid and 122 linoleic acid. It is recommended that a source of vitamin E be taken alongside flax oils. Research indicates that Omega 3 fatty acids are important for the maintenance of a healthy heart, and in helping to maintain joint mobility, as well as healthy skin. Flax Seed Oil is an excellent alternative to fish oils as the oil obtained from flax seed is 50% by weight Alpha-Linolenic Acid and therefore contains almost twice as much Omega 3 per gram of weight than standard strength fish oils. Alpha-Linolenic Acid is converted by the body into the Omega 3 fatty acids EPA and DHA according to its need. As an essential nutrient, Alpha-Linolenic Acid is required in large amounts by the body but because it is highly unstable, it is not always possible to be sure how much is available in the diet. The Flax Seed Oil from Lamberts® is cold pressed to ensure that the nutritive qualities are retained and to protect the ALA from oxidation we use opaque capsule shells and add vitamin E as an antioxidant. Our tests on the degree of saturation (a measure of freshness) show that the precious ALA is stable during the shelf life of the product. Flax Seed Oil is also a useful source of Linoleic Acid, the other main essential fatty acid that our diets must provide. An opaque brown oblong soft capsule. Capsule Shell (Modified Starch Glycerol Gelling Agent: Carageenan Colours: Iron Oxide) Antioxidant: d alpha Tocopherol.